The ‘mayor-making’ celebration is apparently an annual event, but it’s not one I’ve paid much attention to in the past. 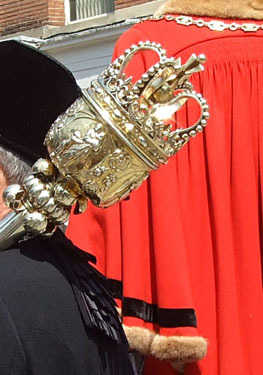 Twitter is proving useful as a ‘what’s on’ alert, and through Twitter I heard about the mayoral procession. The prospect of a robed procession accompanied by music seemed quite appealing. I found myself hanging about outside the Guildhall for the second time in a week. On Monday it had been the arrival point for the York City open-top ‘victory bus’, on this occasion it was to be the departure point for the civic procession. As on Monday, we were waiting for a group of men dressed in red. No other similarities were apparent. 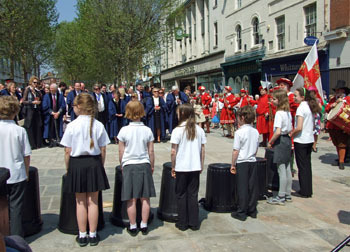 On Monday St Helen’s Square had been crammed full of people, mainly York City fans singing. On this occasion there were a few people looking vaguely interested, vaguely waiting. No singing or flag-waving. 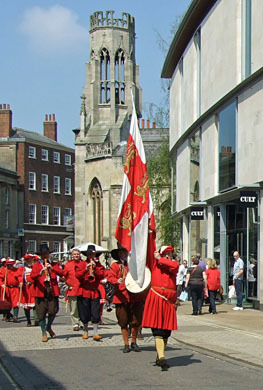 Until the procession emerged, led by a man waving a very impressive flag, and accompanied by the sound of the York Waits, playing traditional music on old-looking instruments. 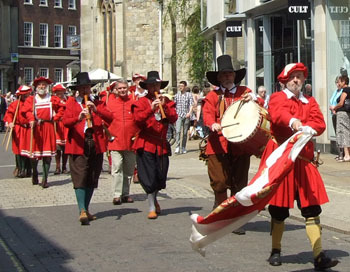 It wasn’t the first time I’d heard the York Waits play, but it’s not that common, and the colourful robes, silk flag and medieval-sounding tunes certainly brought the event to the attention of shoppers. It reminded me of the productions of the York Mystery Plays I’ve seen a couple of times over the last decade. The ones staged on waggons — the ones I see as the ‘real’ mystery plays. The procession between playing stations is accompanied by similar music, played on the move, on traditional instruments, as I guess would have happened when they were staged centuries ago. 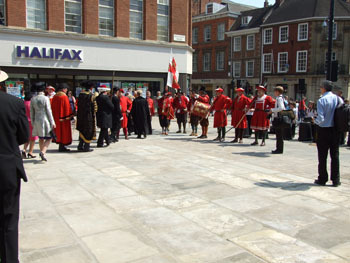 Thankfully the civic procession on 24 May was fairly short, going from the Guildhall to the Merchant Adventurers’ Hall, and pausing on the way at the new open area at the end of Parliament Street. This was of course the site of the ‘Splash Palace’, a rather ornate little toilet block, recently demolished. The information on the council website and on Twitter had mentioned that the civic party would be pausing here briefly and that Kersten England would be reading a proclamation to officially open this ‘new public area’. This I felt I had to see, and was wondering what form the statement would take. Some kind of ‘bless the new pavement and all who walk on it’? Some kind of cleansing ritual to rid the area of its toilet-related associations? A small crowd of spectators had gathered, as the York Guard and the York Waits entered the area, and stood to one side as the rest of the civic party filed into the space. It was a beautiful day, sun beating down (maybe not so comfortable for the robe-wearers), as Kersten England read the promised proclamation I thought I might find rather silly. In fact, I found it all rather touching, and was glad I was wearing sunglasses, as I got tears in my eyes (again). All those councillors standing there, some robed, all smart, looked like they really were part of a great civic tradition. It might have been the effect of too much heat on my head, or the cheering effect of that music, but it seemed for a moment as if it did all mean something real, wasn’t just people going through the motions. We were all there, civic officials and ordinary non-robed folk, representing ‘The City of York’, unified under that banner, and all doing our best. Here we were welcoming in the next Lord Mayor. The robes, the colour, the medieval music, all a reminder of the centuries of people before us, going through their own lives in these city streets. 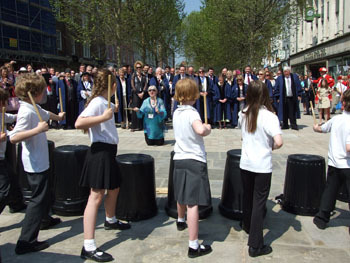 Here, in the 21st century, a group of children performed an impressive drumming routine, using upturned plastic dustbins. Onlookers took photos on smartphones, and the council leader recorded events on his iPad. Then on they went, down Piccadilly, to the Merchant Adventurers’ Hall, for lunch, holding up the progress of several buses. The bus drivers looked resigned to the delay, probably now used to these traffic-delaying celebrations we keep having. By Lisa @YorkStories • 31 May 2012 Happenings & events To link to this page's proper location please use the > permalink.